The world has become addicted to debt. Wall Street loves it because you can play far more interesting games with debt than you can with equities. Consumers love it because it makes up for stagnant wages. Investors love it because it gooses their returns. At the moment, companies pay tax not on earnings before interest but earnings after interest — that gives them an incentive to lever up as much as possible. Last year, Steve Waldman had a great post entitled “Eliminate the business interest tax deduction“; it’s well worth (re)reading in light of what has happened since. In general the multi-trillion-dollar edifice of debt financing is predicated on all manner of artificial tax advantages which are given both to borrowers and to fixed-income investors; tax-free municipal bonds and mortgage-interest tax relief are just two of the most egregious examples here. Forcibly converting mortgages into some kind of shared-equity arrangement where banks get direct exposure to the house price is fraught with difficulty; abolishing mortgage-interest tax relief, however, is easy. And it raises much-needed money for the government as well. I wouldn’t exactly agree that eliminating the mortgage interest tax deduction is easy, but point taken. It’s at least within the realm of imagination. 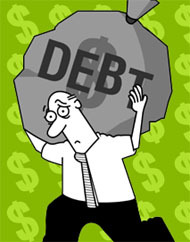 In the past, debt has received preferential tax treatment because it was thought to be good for the economy: it lowered hurdle rates for businesses and encouraged capital-intensive expansions; it gave a boost to the housing industry and encouraged home ownership; and it increased purchasing power and encouraged consumer spending. But that was back in the dark ages, when debt was relatively more expensive than it is now. The financial world has changed a lot in the past 50 years, and debt is now far cheaper, far more easily available, far more efficiently hedged, and far more broadly (and deeply) traded than it was in the immediate postwar era. Its tax advantage might have been justifiable in the past, but it isn’t anymore. We should get rid of it.